Children's Picture Book Database at Miami University | Splash! It is a hot day for all of the animals. Baby elephant has an idea. He leads everyone down to the water for a cool drink. When everyone has had a drink, the fun begins. Splash!Everyone is cool and wet. 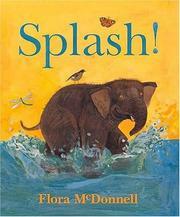 McDonnell, Flora, “Splash!,” Children's Picture Book Database at Miami University, accessed April 24, 2019, https://dlp.lib.miamioh.edu/picturebook/items/show/7175.